Forrester: No Android Tablet Has More Than 5% Share vs iPad. How Does Amazon’s Kindle Fire Compare? On the eve of what may well be the launch of a brand new iPad from Apple comes some new analysis from Forrester Research on the current competitive landscape in tablets — or lack thereof, as the case seems to be. In short: despite the rush of tablets that have come out in the past year, many built on Google’s Android OS, Apple has managed to continue to run away with the competition, and how has 73 percent of the tablet market. No Android tablet maker, it notes, has more than a 5 percent share against it. There is a caveat to Forrester’s research, however. Both Amazon and Barnes & Noble also use Android — albeit versions that have been customized and are no longer on Google’s upgrade track (and service track) as a result. In Forrester’s analysis, Samsung has a 5 percent share; Motorola 4 percent and Acer a 3 percent share. HP’s TouchPad, now discontinued, had a 6 percent share, but that was during that series of crazy fire sales when everyone suddenly rushed to buy one. So how would those numbers look with the $199 Kindle Fire in the mix? Unfortunately we still don’t know exactly: the last numbers that the company released were during its last quarterly results at the end of January, but even these were not concrete. Amazon said that sales of its Kindle products, including the e-readers, had grown 177 percent over the last year and that the Kindle Fire was the bestselling among them. But others have parsed those numbers and have come up with their own sales estimates. Mobile analyst Chetan Sharma tells me that he believes that Amazon sold around four million Kindle Fire tablets in 2011. That would put it behind his estimates for Samsung, at six million, for the full year. But in the holiday quarter alone (the only quarter when the Kindle Fire was actually shipping to customers), Sharma believes Amazon would have come in second place to Apple, which reported that it sold 15.43 million iPad tablets. Others have guessed that Amazon sold more like six million Kindle Fire tablets. If you trust Forrester’s guess on these things, the role that companies like Amazon will play in the tablet market will continue to grow because of two reasons: price and content. Although many Android tablets, such as Samsung’s Galaxy line or Motorola’s Xoom, have been launched with media services in an attempt to punch at the same weight as Apple, it seems that the offerings are not good enough to justify the prices, which have been on par with Apple’s iPad. E-reader effect. Amazon’s Kindle Fire might not yet be denting Apple’s share by too much, but one area where it seems to be having more of an impact is on e-readers. Some research from DigiTimes estimates that shipments of pure-play e-reading devices will be down to only two million units this quarter, compared with nine million in the same quarter a year ago. 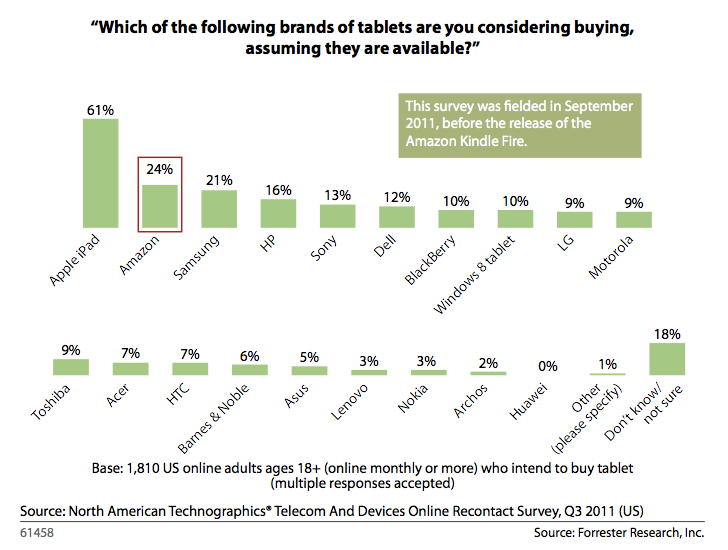 It says this is down to the “substitution” effect of people opting for products like the Kindle Fire instead. That kind of cannibalization, to be honest, seems only to spell good news for Apple, as it means that more people are looking for devices that are bigger than smartphones, yet still portable, but are loaded up with more features than an e-reader: that’s a market where Apple has consistently set the bar. It’s still a market that is wide open for change: Forrester believes that by 2016, only about one-third of U.S. adults will own an iPad, and that’s before even considering what might happen in other markets.